Chocolate Soufflé: A soufflé is a lightly baked cake made with egg yolks and beaten egg whites combined with various other ingredients and served as a savory main dish or sweetened as a dessert. The chocolate soufflé has a delicious molten center, and a light, springy exterior – pure chocolaty decadence from the inside out. Serve your chocolate soufflé with a dusting of powdered sugar and crème anglaise for your dinner party to make it a hit. Generously butter the soufflé dish and sprinkle with sugar, knocking out the excess. Melt the chocolate in a metal bowl set over a saucepan of barely simmering water, stirring occasionally until smooth. Remove bowl from heat and stir in yolks (mixture will stiffen). Beat the egg whites with a pinch of salt in a large bowl with an electric mixer at medium speed until they just hold soft peaks. Add in the 1/3 cup sugar, a little at a time, continuing to beat at medium speed. After all the sugar is mixed in then beat at high speed until whites just hold stiff peaks. Stir about 1 cup whites into chocolate mixture to lighten the mixture. Then add the chocolate mixture to remaining whites, folding gently but thoroughly. Spoon the mixture into prepared soufflé dish and run the end of your thumb around inside edge of soufflé dish (this will help soufflé raise evenly). Bake in middle of oven until puffed and crusted on top but still jiggly in center, takes around 24 to 26 minutes. Chocolate soufflé is ready to be served. Serve immediately with lightly sweetened whipped cream or crème anglaise. Soufflé can be assembled up to 30 minutes before baking. Keep, covered with an inverted large bowl (do not let bowl touch soufflé), at room temperature. 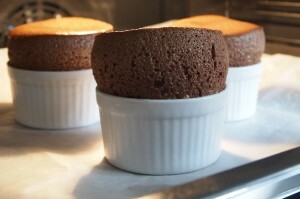 If you have any queries regarding the Chocolate Soufflé recipe, please leave a comment.